Are you planning a business trip or holiday and dreading having to use those pancake-like pillows you often find in hotels? We have the solution for you! 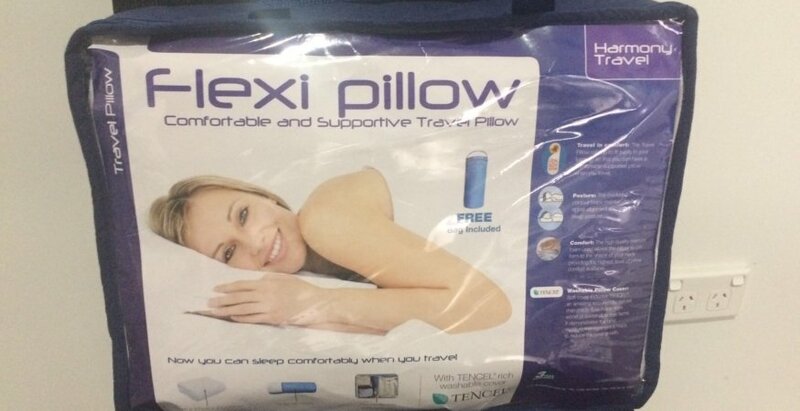 We are super excited to be stocking the Harmony Travel Pillow by Flexi Pillow at Muscle Freedom. No more waking up with a sore neck or headache while on holidays – just take this bad boy with you wherever you go! It rolls up neatly into a small bag that’s compact enough to fit into carry-on luggage. The travel pillow is medium to firm and provides plenty of support for your neck and spine. The premium dense memory foam is 60kg/m3, which is ultra pressure-relieving and conforms perfectly to the curves of the neck and shoulders. Best of all, the fabric is moisture-absorbent and anti-bacterial, so if you’re a drooler, you’re covered. To find out more, please ask your remedial massage therapist or myotherapist about the Harmony Travel Pillows at your next appointment.